SkylarkSafe is a simple encryption / decryption program especially useful for editing securely encrypted text files. Free for personal use. Right click on this link (and choose "Save link as...") to save the program to your hard drive. Since this is a new program, it may be flagged as unsafe by your antivirus software. If so, select 'View Details' and 'Trust' in your security options. This program (as with all Skylark software) does not need to be installed, so it can be simply copied to a memory stick and run from there. For added security, run the program while disconnected from all networks and from the Internet. SkylarkSafe does not use the registry, instead it creates a simple preferences file in the same folder in which it was run. 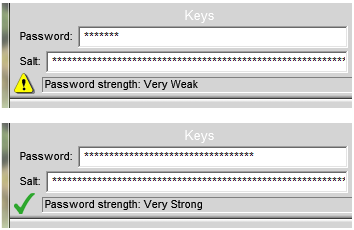 An encrypted version of your Salt is saved in the preferences file, but your password is never saved, so make sure to remember your password. You should save a copy of your Salt preferably in an offline memory stick. SkylarkSafe uses AES (CFB) 128 bit encryption (re Vincent Rijmen and Joan Daemen, via Apache License 2.0, see http://www.apache.org/licenses/LICENSE-2.0) with salted and hashed passwords with an optional user specific 32 character salt value. It can encrypt and decrypt any file, but is specifically useful to edit and save secure text in an encypted text file. It also contains some useful utilities such as generating a hash of a file or password, creating 81 tryte IOTA keys, etc. Release version 1.00 adds text printing and changes the name to SkylarkSafe to avoid false positives in Norton Antivirus. 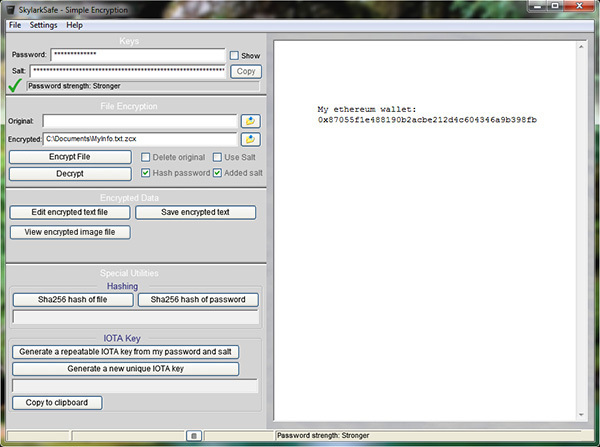 Beta version 0.92 adds viewing and printing encrypted image files. Beta version 0.91 improves prompts to save edited text when closing, and adds more 'How To' help text. SkylarkSafe is free for personal use, but we ask businesses and invite you to donate if you find it useful and would like to see improvements and updates. Recommended donation/cost is 0.02 Litecoin, 0.01 Etherium, $5 for individual use or $10 for businesses but any support is sincerely appreciated. Normal disclaimer: We do not warrant that this program works or will not fail or that the encryption will not eventually be cracked, or that it won't crash and lose your data, so please keep an offline backup of all your important data. Most especially, do not forget your password and keep a copy of your salt value! To open your encrypted files on a new computer you will need your password and to paste your original Salt value into the new PC. SkylarkSafe normally salts and hashes passwords for brute force safe encryption, but very strong passwords can be used directly if needed.